Star Buy - only available in store while stocks last. Less than 10p a pop! Aldi's Magnum Classic are £2.69 for 50. They work just as well IMO. Not voted. 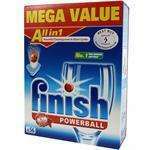 I get the classic powerballs from B&M for £1 for 15 and as i use salt and rinse aid anyway they work great. Aldi's Magnum Classic are £2.69 for 50. They work just as well IMO. Not … Aldi's Magnum Classic are £2.69 for 50. They work just as well IMO. Not voted. I agree (wouldn't pay more than 5p a tablet myself) but some people prefer branded products in which case these are a good buy. Less then 10p a pop is what I aim for, Hot!